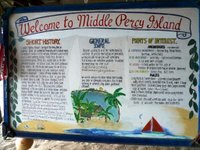 We spent a couple of nights in the Percy Islands, in an anchorage at the northeast island. We tried a dive but the visibility was very poor. The highlight of the dive was a giant snail with a shell over a foot long. A switch to the northwest was forecast, with some reasonably strong winds, so we decided to leave. The Percy Islands have a couple of anchorages that are good for winds from the north but the expected shift to the south, as the front went over during the night, might have been a problem. We stopped at West Bay on Middle Percy Island and met several catamarans who were planning to go into a tidal creek at high tide and go high and dry while they wait out the windier weather. We decided to proceed with our original plan and leave for Mackay Marina overnight. 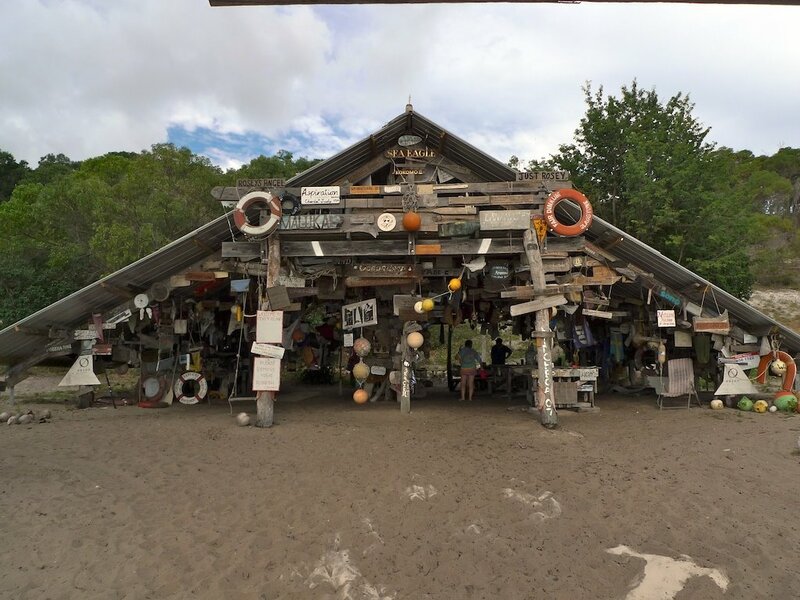 Before we sailed we added a Dos Gatos token to the collection adorning an A-frame hut on the beach. We arrived at Mackay early Friday morning. We had the surreal experience in the early hours of motoring through dozens of anchored ships - we estimated 50+. We saw them in tiers on the radar and several were visible at a time as they loomed out of the early morning fog. We were told later that these ships are waiting to fill with coal at Hay Point. Some wait there for weeks apparently. 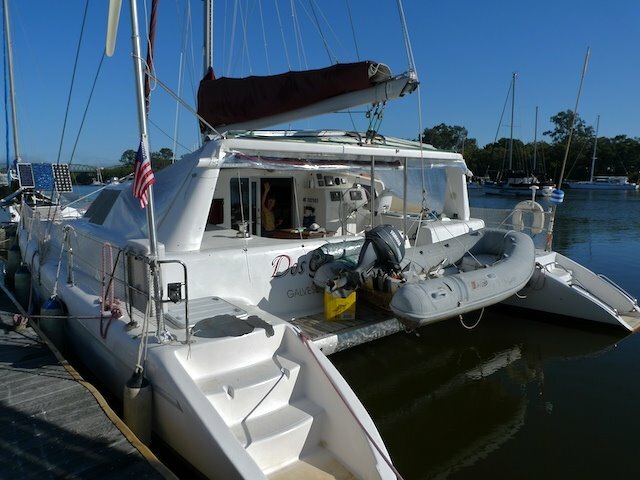 We spent 4 days in Mackay Marina. We rented a car and went shopping for groceries. We also spent Sunday sightseeing and visited the Botanic Garden in Mackay, and the nearby Cape Hillsborough National Park. Today, we fuelled up and headed for Brampton Island, our next stop on the way to the Whitsundays. We spent three days at Fitzroy Reef and dived once. We would have made a second dive but I spent a day fixing the compressor! Fitzroy Reef is similar to Lady Musgrave but without the island. The anchorable part of the lagoon is smaller, but still has room for plenty of boats. The entrance is narrower and has a dogleg - tricky for a wide catamaran. We shared it with a few fishing boats - private and commercial. A big boat turned up on the second day and anchored while smaller boats ferried snorkelers around while they collected, presumably, lobsters. Both Lady Musgrave and Fitzroy are uncomfortable when winds and seas increase. When the tide is up the waves come over the coral and a big chop builds up in the lagoon. So after two days of 20-25 kt winds we left to find somewhere more comfortable. We went 35 miles to Northwest Island. That was not the comfortable anchorage we sought! We were partly behind a small island but mainly (not much) sheltered by a reef. 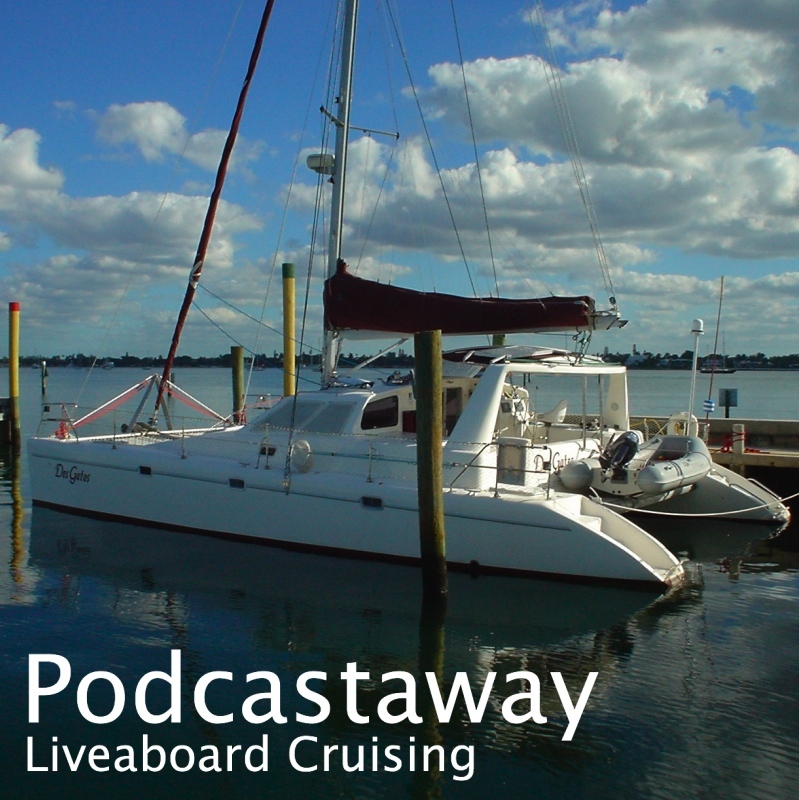 We spent one night and set off again for a 45 mile passage to Great Keppel Island. Now we have a secure spot - off a beach behind an island. The wind is blowing hard and a small amount of swell comes around to us but it's the best anchorage we've had in two weeks! We'll stay here until it settles and then move on north. We spent a week at Lady Musgrave Island which comprises an enclosed atoll lagoon with an island at one end. The island is very pleasant and offers a beach, a campground and a woodland walk. It's a nesting area for Black Noddies, Mutton Birds and a species of Rail. All were present in numbers except for the Muttton Birds - they must be elsewhere. We saw their nesting holes, though. The island is also used by nesting turtles some times in the year. We saw turtles in the lagoon but none appeared to be nesting. 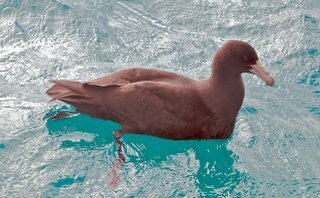 Paddling around the anchorage was a large unfamiliar bird - a Northern Giant-Petrel. And giant it was. It has the tube nose typical of a petrel - but it's the size of a turkey! Albatross sized. We've never seen one of those before. Lady Musgrave Island is visted almost daily by a tourist boat out from The Town of 1770 - called The Spirit of 1770. It ties to a pontoon and transfers its passengers to a small fleet of boats that remain moored in the lagoon. One takes some people diving, another takes some fishing, and a third is a glass bottomed snorkeling boat. Tourists also swim and go ashore - and presumably some stay overnight in the campground. The campground lacks water, but it does have composting toilets, and carts to transport your water from The Spirit of 1770. We made three dives here - our first of the season - and once we'd figured out how much neoprene we needed to stay warm - the temperature was 69 F - the dives were good. Our first was inside the lagoon, and our second and third were outside the entrance channel. Good coral and a lot of fish. Several new species for us, and a Manta Ray. We've now moved 20 miles northwest to another atoll called Fitzroy Reef. No island here, just coral reef. Lady Musgrave and her sister island Lady Elliot mark the southern extremity of the Great Barrier Reef. We'll work north along it over the coming months. We plan to spend a few days here and start out diving and snorkeling. If only it were warmer; it encourages us to get further north as soon as we can.